We provide a range of website design and development services for all your business needs. 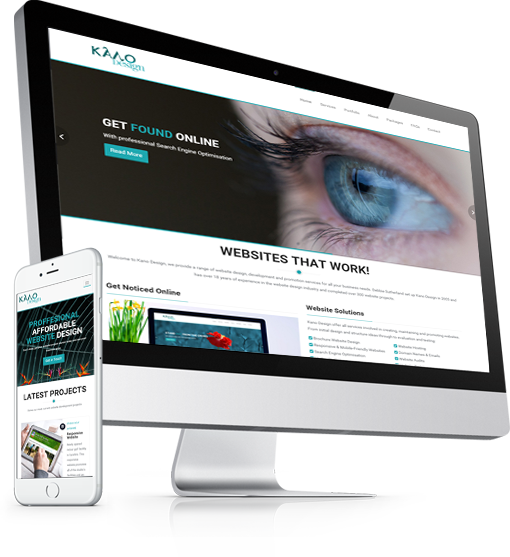 Whether you're starting up a new business venture or your existing website is just a bit lacklustre Kano Design can help. A simple yet eye-catching brochure website is ideal for new businesses looking to have an online presence. From your corporate identity and content we can create a professional website that will help you stay ahead of your competition and thrive online. With more and more people accessing the internet from their phones and mobile devices it is recommended that your website can be easily browsed on them. We can create a website that displays differently according to the user's device or create a separate mobile/tablet version of an existing site. Search Engine Optimisation (SEO) is a key factor in creating a successful online presence. You wouldn't buy glossy brochures and keep them in a cupboard, so why have a website no one can find? Kano Design offers website marketing and promotion as standard. Interested in working with us? Here is a breakdown of the key stages involved in a new website project.